I’ve been really hungry lately, Truthfully, I’m always really hungry, but it seems especially bad lately. I think it’s because I’ve finally started working out again post baby. Being hungry is good and bad for me. I love to eat, but I actually hate snacks. I pretty much never want to eat snacks. More often than not they aren’t very good, and then you can’t eat something you really want to eat because you’re full. Also, rarely are snacks good for you, at least the ones that taste good. So, I don’ t like snacks. If I do snack (and I do, several times a day) I usually eat a small portion of leftovers because it’s just better food. I’m ranting about this because this Pâté is an exception. I made it for guests, and then ended up eating it for days and looking forward to it! This delightful Pâté -originally from the Veganomicon– is super easy, and you probably have almost everything in your pantry. I used fresh herbs in mine because I happened to have them hanging around. The original recipe calls for dried so I’m sure that would be fine if it’s what you have on hand. Heat 2 tablespoons of the olive oil in a large skillet over medium heat. Addthe garlic, thyme, tarragon, salt, and pepper, and cook another minute. Add the mushrooms and cook for 7 to 10 minutes until they are very soft, lowering the heat if necessary to prevent them from burning. While the mushrooms are cooking, place the walnuts in a food processor or blender and process until very fine. Add the cooked mushroom mixture to the walnuts in the food processor, along with the balsamic vinegar, beans, and remaining tablespoon of olive oil. Process until smooth, adding the vegetable broth 1 tablespoon at a time as needed to make a smooth puree. Note: I didn’t need to use any. 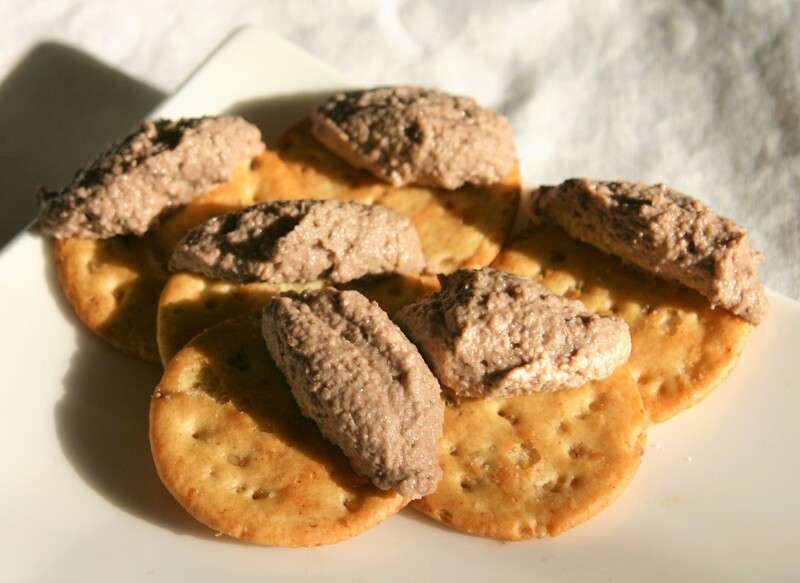 Continue to puree the ingredients until the pate resembles a smooth, thick and spreadable paste. Scrap mixture into an airtight container and chill for at least an hour before serving, to allow the flavors to meld.